Yesterday my neighbor, Jim, and I went fishing on Spring Creek, Centre County, Pennsylvania. This was a prearranged trip through a customer who lives near Altoona. His name is Bruce; he’s bought my DVD’s, commented here on the blog, and recently bought a set of seven color variations of samples of my Floating Caddis / Mayfly Emerger, along with the recipes and instructions. Bruce and I have been in e-mail contact for the past seven or eight years. We started planning this trip about three weeks ago. I have not yet received my new camera, and I could just simply forget about this, but I wanted to write a review of the trip yesterday, so I’ll make an effort to paint pictures with words. A fourth companion, Ed, who used to own a rod making company in Beech Creek, also joined us. I’ve known Ed since the 1980’s; he used to display and sell at the Susquehanna Chapter Trout Unlimited Annual Outdoor Show. We’ve seen each other on occasion in recent years at the Fly Fishing Show in Somerset, New Jersey. Unfortunately Ed has some health issues that prevent him from fishing, but he wanted to come along and offered to cook lunch for everyone. About that, “Such a deal!” my wife Lou Anne, would always say. We met at the bridge at the park in Milesburg at 9:30. There was heavy fog in the area, though I had worn my sunglasses for the drive down. The water flow was low, but the stream is larger in that section, so there was plenty of water. We rigged up and dispersed, staying relatively close together. I wanted to fish the section below the bridge that is normally rough and tumble riffs and white water, and pretty difficult to fish and wade in early season. 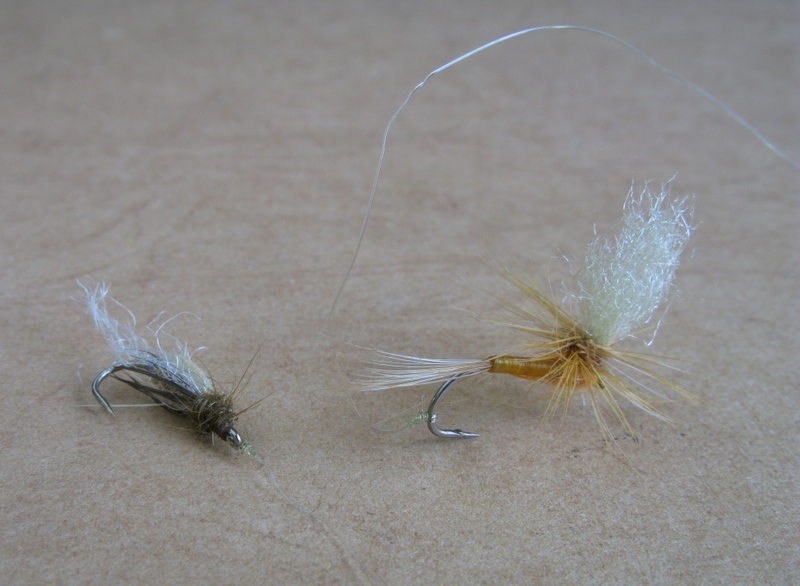 I had tied a #20 Flashback Pheasant Tail nymph on a twelve or so foot leader, to a 5x tippet, one #4 split shot, and to start, about two feet under an indicator. Second cast, “Fish on!” Fifth cast, after lowering the fly another foot to fish the slightly deeper water beyond where I took the first trout, “Fish on!” With nymphing, most anglers would simply keep casting. I learned and have always believed and taught my students over the years that an indicator should be one that is easily moveable, because a cast with set rigging in one place may not be correctly set up for making another cast even two feet away from the previously fished drift lane. Effective nymph fishing is all about versatility and constant observation, making necessary adjustments to your rig so that your presentation is correct for every location you fish. Rigging adjustments of the indicator placement also includes adding or removing split shot. I constantly make adjustments in my rig, changing patterns far less frequently than making other adjustments of weight and indicator placement. Jim fished the junction pool with Bald Eagle Creek and took one fish swinging a #16 winged wet fly, not sure of the pattern; it was basically a Ginger Quill, but had a brown hackle and dark quill body. After two trout in the first three minutes, I over-confidently thought I was going to kill ’em. Wrong. I fished hard, thoroughly working the seams, riffs, and runs all the way to the mouth, for more than an hour, with nary another strike. I motioned to Jim that I was going to head back upstream. I entered and fished first pool below the bridge with the same nymph. After a little while, Jim came up and I commented that I was starting to see a few small bugs in the air. The number of these insects steadily increased in minutes. I thought they were Tricos, but I couldn’t see the tails. Guess it was just the lighting, or perhaps my need for new glasses. Jim finally caught one and positively identified them as Trico spinners. No trout were rising, and it was about eleven-thirty. I decided since the nymphing had been fruitless, that I would prepare for the hoped-for trico spinner fall and rise of trout. So I added 6x tippet, rummaged through my fly boxes and tied on a #22 Trico Spinner in anticipation of some surface action. That paid off. The heaviest part of the rise probably occurred after we departed for lunch, but I managed to take two trout that I saw rising, stung a third, and had three more rise and miss the fly. When Jim arrived, having hooked a couple fish, we gathered Bruce, who had landed six, from upstream and headed for our lunch rendezvous with Ed at Fisherman’s Paradise. When we pulled in, Ed had the grill smoking. Nice! This was indeed, such a deal! Ed had thick, juicy elk burgers sizzling away, with the addition of hickory chips to the fire. Added to this were sliced whole wheat buns, a jar of Ed’s home-canned hot peppers, sliced, garden-fresh tomatoes, big, but nice and thin, sweet onion slices, a bag of chips that Bruce brought, plus a batch of home-made potato salad from yours truly. I included the recipe at the end of this post, for anyone interested. It’s pretty good. Hook: Straight-eye dry, #20 – #24. Retrieving my rod from the car, which by the way, was a nine-foot, five-weight with a six weight line – way too heavy for low-water fall fishing in most people’s minds – more on that later; I walked over, stood at the water’s edge, since wading is prohibited in this area, and started casting and observing. I had a small audience by now, another fellow had joined Ed, Jim, and Bruce. Working the first trout I saw rising, he came up with a nice swirl, but missed the fly. A minute or so later, I hooked the first one. 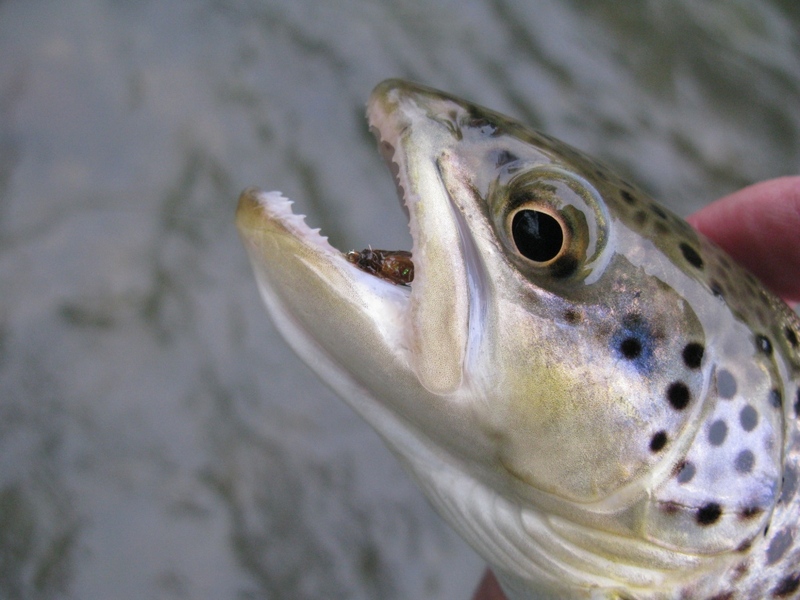 I landed and released that one, and I rose and stung a second trout in short order. Even though there really was not a major rise in process, Jim commented, “These fish must be looking for those spinners.” Surely, Jim was correct; the trout have had Trico spinners on the daily menu for a few weeks already. 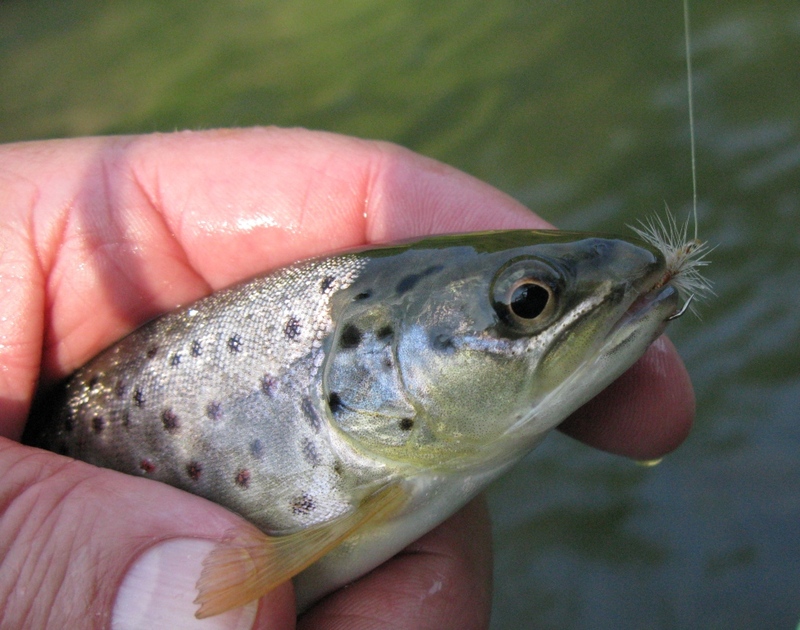 Trico hatch number two in the fall begins fifty-nine days following the emergence and mating of the first Tricos in July. “We can go below Bellefonte if you want to,” I replied. We made arrangements to go downstream, below town, just below the entry of a small tributary named Buffalo Run. We parked our vehicles and got out. I spent the first half-hour sitting and talking with Ed on a convenient stream-side bench, catching up on things, watching the water for rises. Saw none. Bruce hooked a couple trout on nymphs at the head of the pool. After a while, I started fishing with that Trico spinner anyway, thinking I might interest a fish or two. I know, using a Trico as an attractor or search pattern isn’t high on most angler’s list of regular tactics, but that’s what I did. To no avail. Jim hooked a trout or two on nymphs. After about an hour, Ed departed and the three of us walked downstream to the old bridge abutment near the sewage treatment plant. By then I figured if I was going to catch any more fish, I better rig up with nymphs again. So I did. 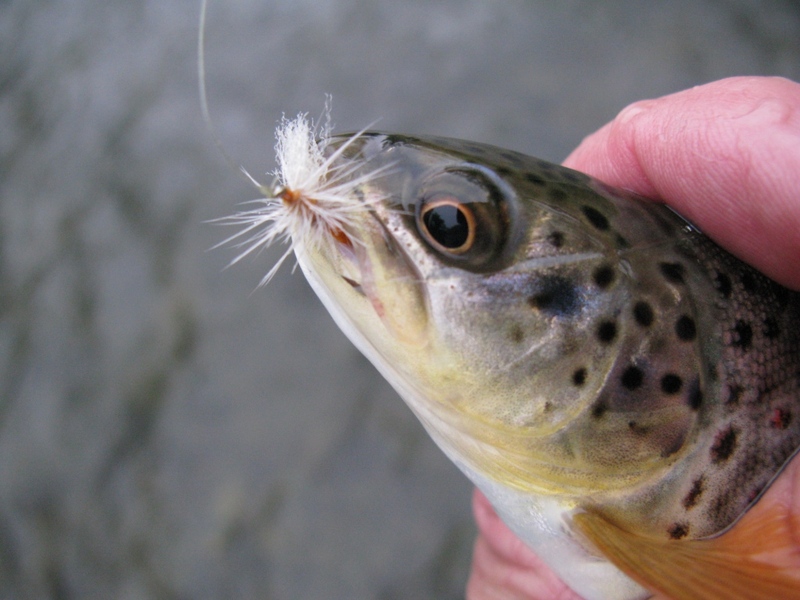 I tried a pink San Juan Worm, but in a few minutes lost the whole rig on brush that hung out from the bridge abutment. When I re-rigged, I put the same fly on, but in wine color. Hooked a nice, acrobatic rainbow about thirteen inches in length, who stayed on long enough to give me some action, complete with a couple jumps. Then he got off, saving me the trouble of getting my hands wet. About 4:40 PM Jim and I decided to head upstream, to catch up with Bruce who had started fishing his way upstream a half-hour or so earlier. He had not done a thing. The three of us were ready to call it a day. “My best guess is blue-wing olives,” I replied. “The light is less intense, we’ve had a bit of cloud cover this afternoon, and they’re the bug in season,” I added. We decided we could not walk away from this potentially entertaining opportunity. We went along the railroad tracks some distance, to a spot just below the middle of the pool, and I sat down to detach my nymph rig. Removing shot, indicator, and nymph, I tied on a section of 6x tippet, and then knotted a dark-bodied BWO Thorax Dun pattern, #20 to the tippet. 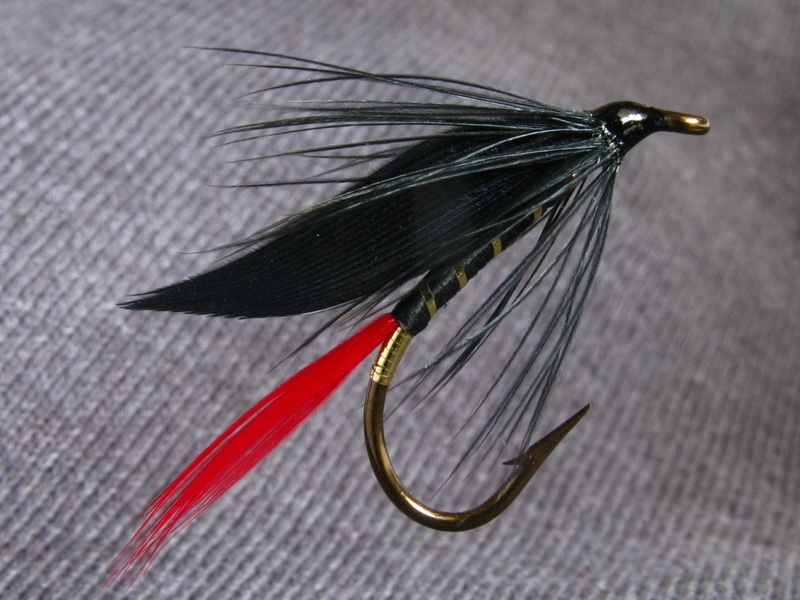 The wing was gray E. P Fibers with a dark dun hackle, clipped on the bottom. Bruce entered the water below some rising fish. I chose to stay on the bank, kneeling or sitting as I targeted some rising trout close to shore. After some futile attempts at these fish, which were in very shallow water, I decided to move upstream, above Bruce, where the water was deeper, hoping for better luck. Here’s where my nine-foot, five-weight rod with six-weight line came in handy again. Some of the trout were rising against the far side. The railroad tracks were behind us, so there was unlimited back casting room. Unlike Jim and Bruce, I stayed on the bank. 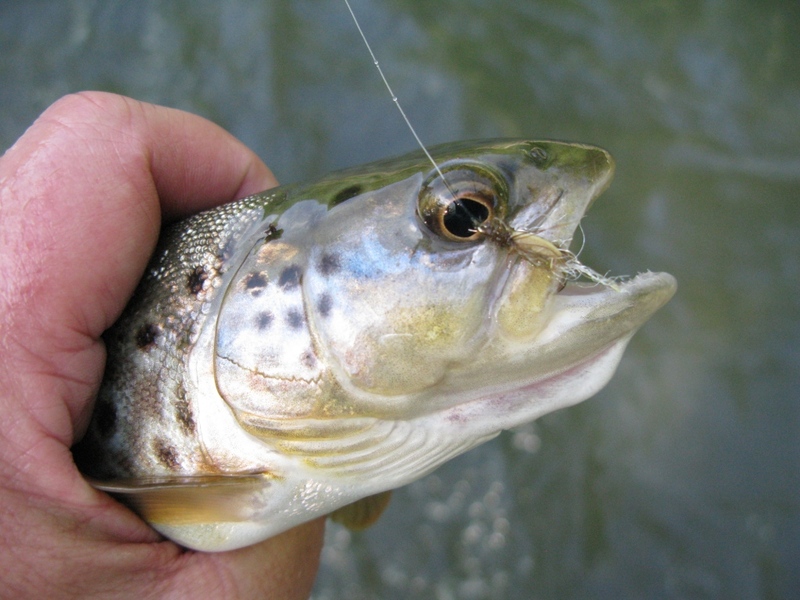 Working a few trout, soon I hooked and landed one in the middle of the stream. Eventually I was targeting the trout rising along the far side. The nice thing about the heavier rod and line: I could pick up the entire line, make one back cast, and one stroke forward – and be right back on target. No stripping, no unnecessary false casting, no having to reset my accuracy and distance to the target. This tactic makes for more effective and more efficient fishing, simply because your fly spends more time on the water and less time in the air. And this was possible with the heavier rod and line, despite the fact that I was making fifty-to-sixty foot casts. I learned that earlier last year one day on Spring Creek in the Paradise, when the wind was gusty and brisk. My companions (all using three and four weights) wondered how I could cast so easily in the wind, even to rising trout against the opposite bank. 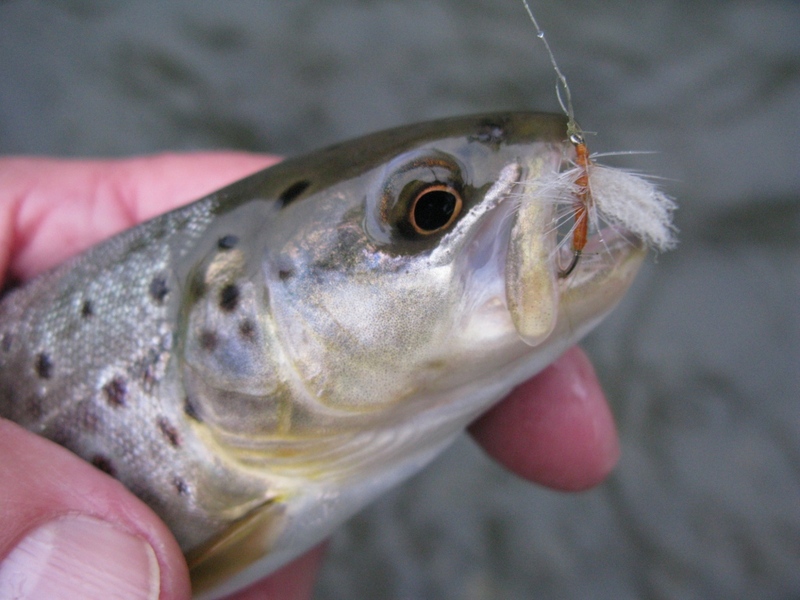 Remember too, that with the addition of a couple feet of 6x tippet, my leader was probably fourteen feet long. I hooked and landed two fish, lost another one, and had four more miss the fly. Bruce and Jim each took fish as well, we were all using various BWO dry patterns. What a great way to close the day of a fine fishing trip! When we returned to our cars, as we were taking our boots and waders off, Bruce got a cellphone call from Ed. He had gone to Fly Fisher’s Paradise Fly Shop in State College. The fishing report from every angler coming into the shop was: everyone was skunked. 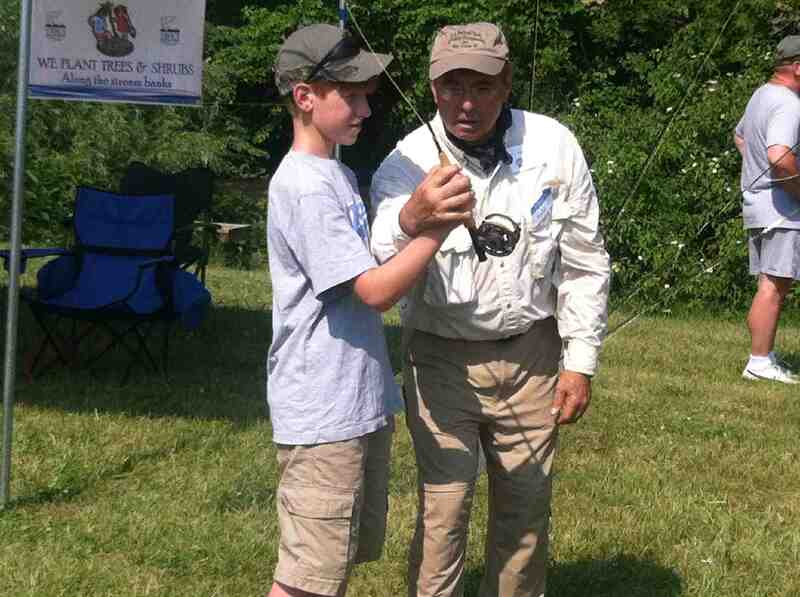 And Bruce questioned again Ed to make sure, there were no reports of other anglers taking any trout that day. That made us all feel even better. 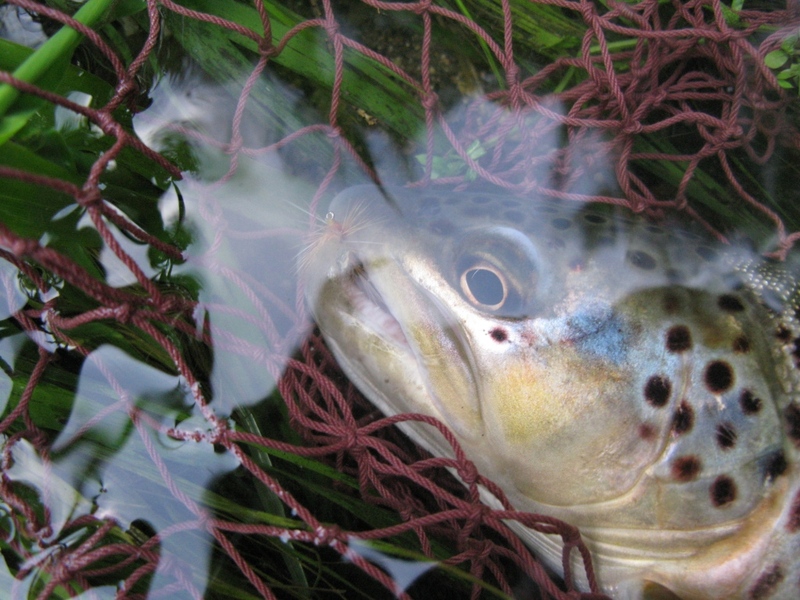 It’s especially rewarding to be able to catch trout under adverse conditions and circumstances. The best part of the day was not the fishing, it was the camaraderie, the great lunch, and the promise among us all to do it again. My wife, Lou Anne, made potato salad from a recipe. And it was really good, heavily spiced with crushed dill. But I seldom use a recipe for most of my cooking, unless I’m preparing a dish where exacting recipe components and quantities are necessary. When I make potato salad, macaroni salad, pasta salad, etc., depending on how much I make, I always estimate or “eyeball” the amount of the spices, seasonings, and dressing. This can be made in as small or as large of a batch as you desire, from a few servings, or perhaps where some leftovers are desired, to a large casserole dish for a family or church picnic. Use any kind of potato. It’s even OK to mix varieties, a few red skinned taters add color. Three to ten potatoes will make a small to a large batch, depending on the size of your taters. Wash them of course, but I do not peel them. Dice into bite-size pieces. Cook 10 to 11 minutes. You can taste if you like. They’ve got to be done, but not Al dente, nor do you want them mushy. Drain. Use two to four hard-boiled eggs. I like to saute` my onions and celery in butter or light olive oil until they begin to caramelize. These are added to the cooked potatoes. If you want to skip this step, simply pour the hot potatoes on top of the diced celery and onion in a dish and leave at room temperature. The heat from the potatoes will soften the onions and celery somewhat, but I prefer the added flavor from the caramelized vegetables. Primarily you’ll need mayonnaise, 1/2 to 1-1/2 cups, depending on the size of your batch. It’s best to add some gradually and mix it in, then you can usually see if more is needed. I don’t like soppy potato salad. Additionally you’ll need: Salt, pepper, crushed dill, garlic powder (not garlic salt which is mostly salt! ), or garlic and rosemary ground mix, and paprika. A little rosemary by itself is also good. I also add one to three tablespoons of vinegar, sometimes adding and mixing it to a small bit of Italian dressing, like when the bottle is about empty. Pout the whole blend over the salad, I generally do this before adding the mayo. Also, a little mustard can be added, either yellow, Djion, spicy brown, or a horseradish mustard. Another nice variation is to add some blue cheese crumbles to the potato salad. I dice my eggs and mix them throughout, but one could also slice them and arrange them on top. Paprika sprinkled on the finished salad is a nice touch. The same basic recipe can be used for macaroni salad. You can eat it fresh made, but it’s always better after it has had time to steep in the fridge. Enjoy! 1. 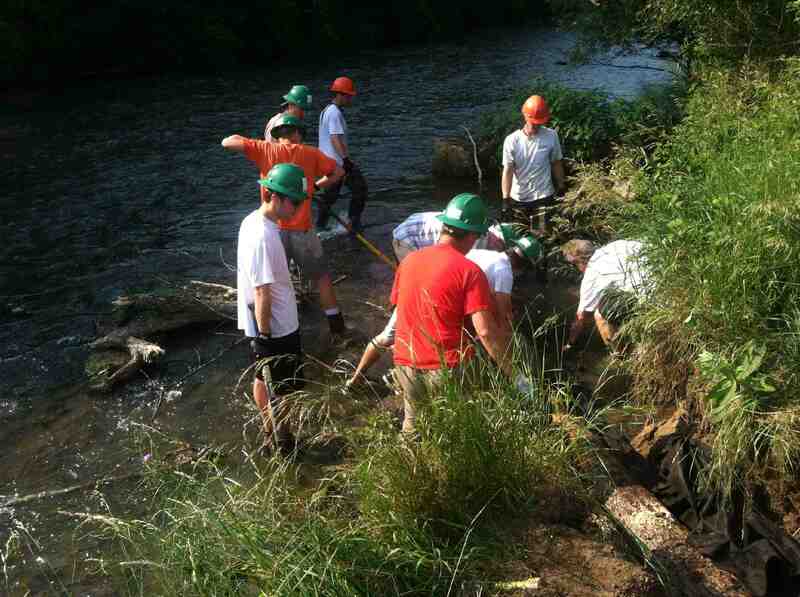 We had a total of 18 volunteers on June 24, and 17 volunteers on June 25. 2. We were able to complete 95% of the construction of the mud-sill on Monday with final rock placement this morning, (on July 3rd). 3. We installed 5 multi-log vane deflectors using 25 ‘ logs today, (July 3rd), before we broke for lunch. 4. 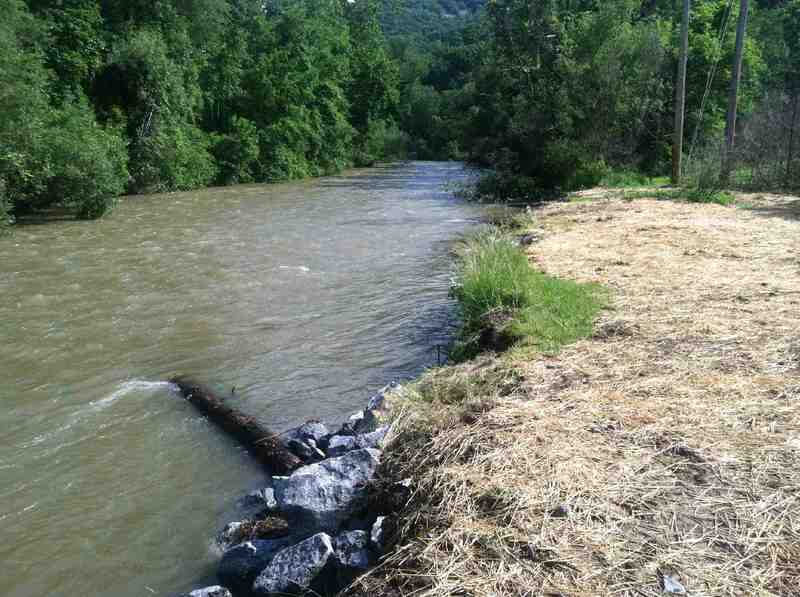 A total of 160 tons of #6 Limestone rock was used to stabilize the stream between the two locations. 4. We planted grass seed and covered it with straw. 5. The final seeding was extremely wet as the storms came – but some valiant volunteers finished the seeding. 6. The deflectors and mud-sill stood up very well in spite of being tested extensively by a major storm on June 27th. 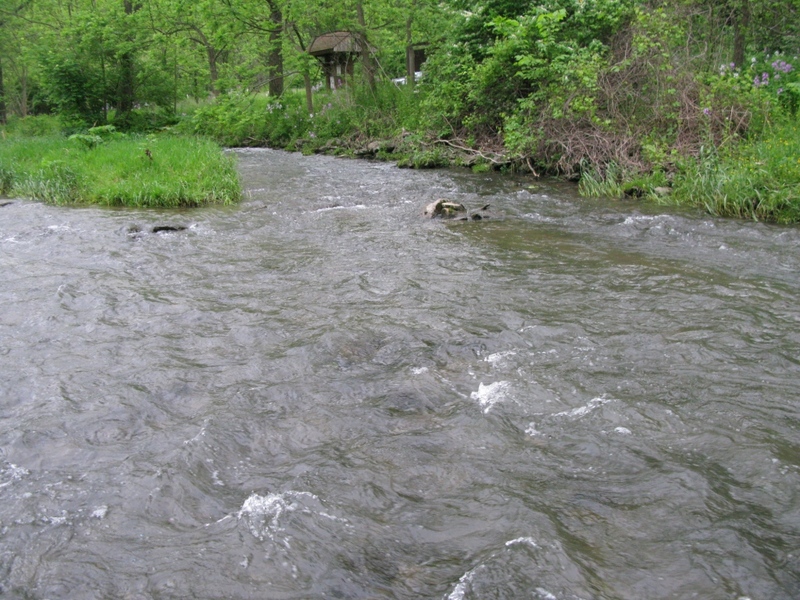 Spring Creek, at Milesburg, Pennsylvania – in the project area before work was started. Informal stream side session on aquatic entomology. Checking out that fly rod grip. Work progresses for the installation of a log vein. I believe there were also personnel from the Pennsylvania Fish and Boat Commission. This was a very successful project. We were able to construct the longest mud-sill to date on Spring Creek, and install five multi-log vane deflectors in two-and-a-half day’s work. 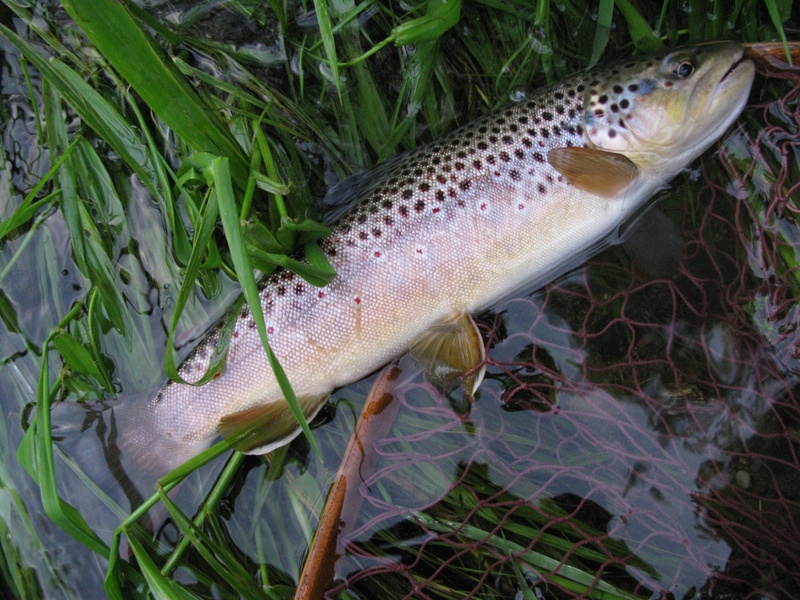 On July 3rd we actually watched a fly fisherman catch a nice brown trout behind a rock next to the new mud-sill. Included here are some of the Chapter photos of the project. Still working on that log vein installation…the large hand-drills are used to drill through the logs for placement of steel re-bars to anchor the logs to the stream bed. 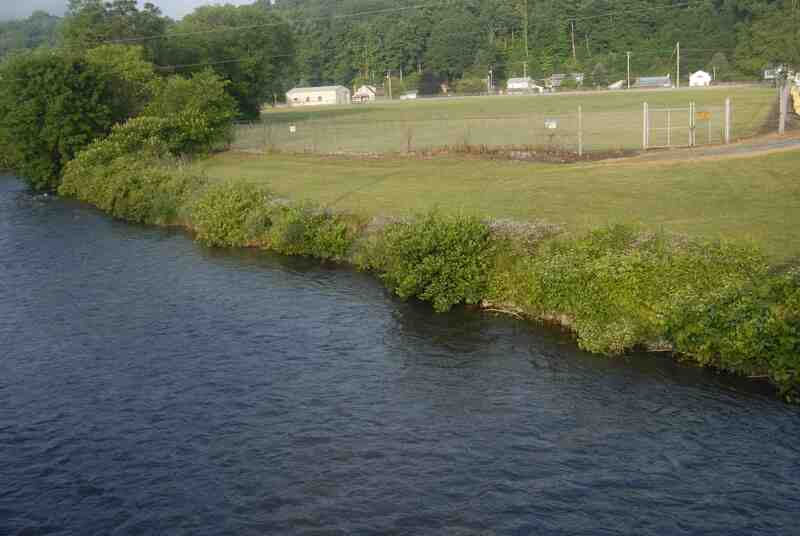 Looking downstream toward part of the project area. Upstream view at a log vein site. There is a second log vein upstream, just to the left of the utility poles on the right-hand bank, and a third one, submerged between the two. Area of limestone rock rip-rap, looking upstream from the bridge at the park in Milesburg. The ground has been seeded and mulched with straw. 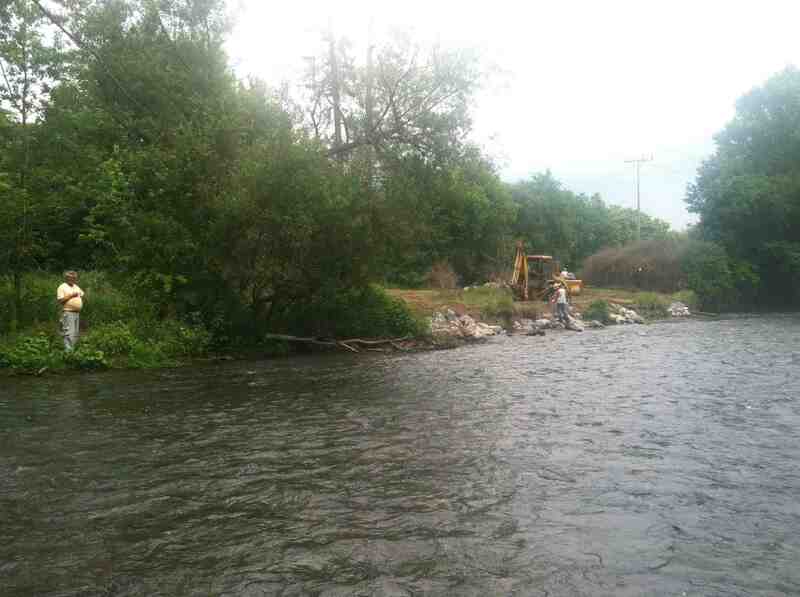 This will help to secure the stream bank and greatly reduce erosion. 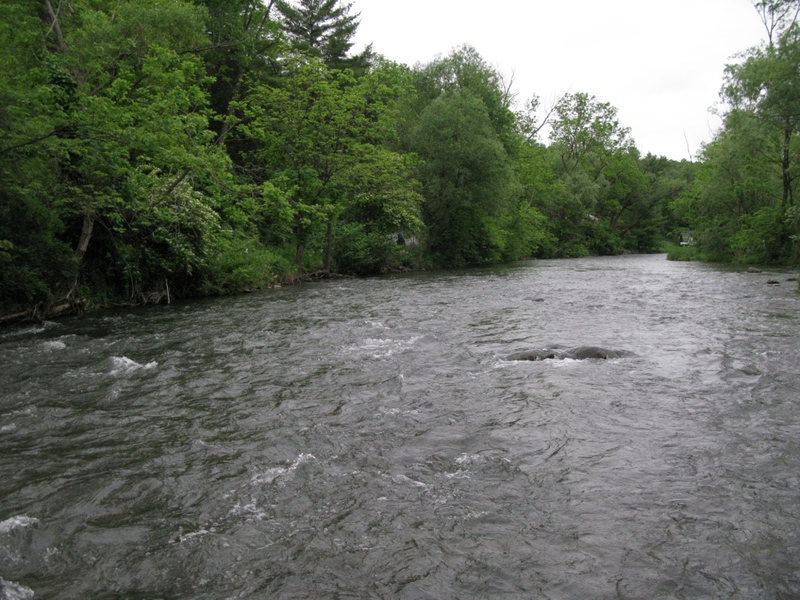 The submerged rocks also provide cover for trout and habitat for aquatic insects. Once again, thanks to all of our volunteers. We are now planning the planting stages….keep tuned. October 7th & 8th our chapter will need 15 volunteers to assist in the planting of trees and shrubs in Milesburg. The in-stream work is complete. Now we need to do the planting along the bank. We will be obtaining the plants and other materials from the Western Pennsylvania Conservancy. At present we are awaiting contract approval from the landowner – FirstEnergy. The above dates are tentative, pending approval from FirstEnergy. I’d like to add that this project is great news. 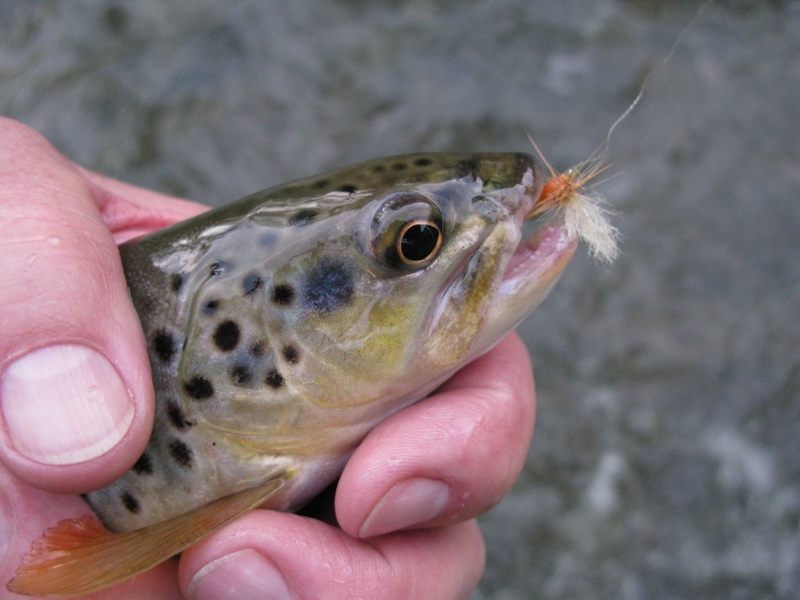 it is sure to enhance the fishing in this section of stream. In fact the last several years have seen good developments for Spring Creek and increased and enhanced angling opportunities. In 2007 the old McCoy dam below Bellefonte was removed, and the Spring Creek Trout Unlimited Chapter and PA Fish and Boat Commission work installed log veins and stream improvement devices in that section. 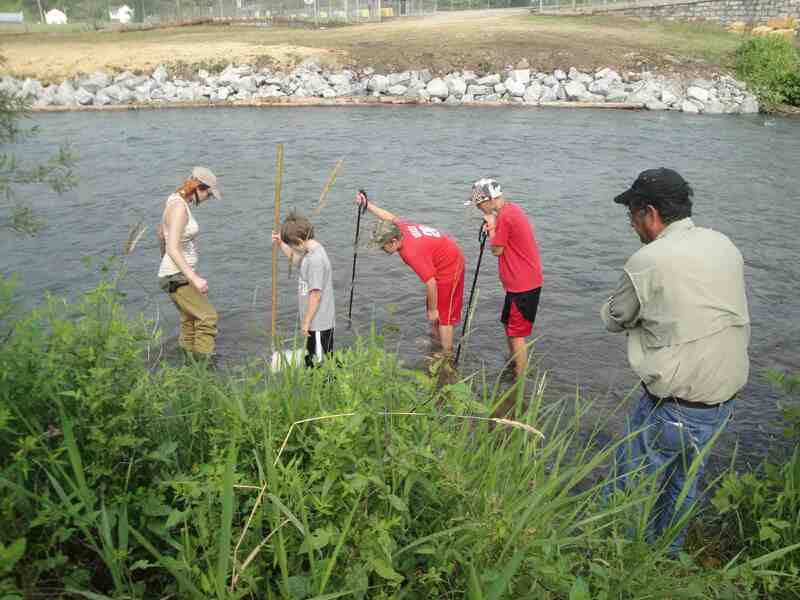 The dam removal opened up to fishing a new stretch of about one-quarter mile that was formerly inundated with water. The McCoy dam had been in place since the late 1700’s. 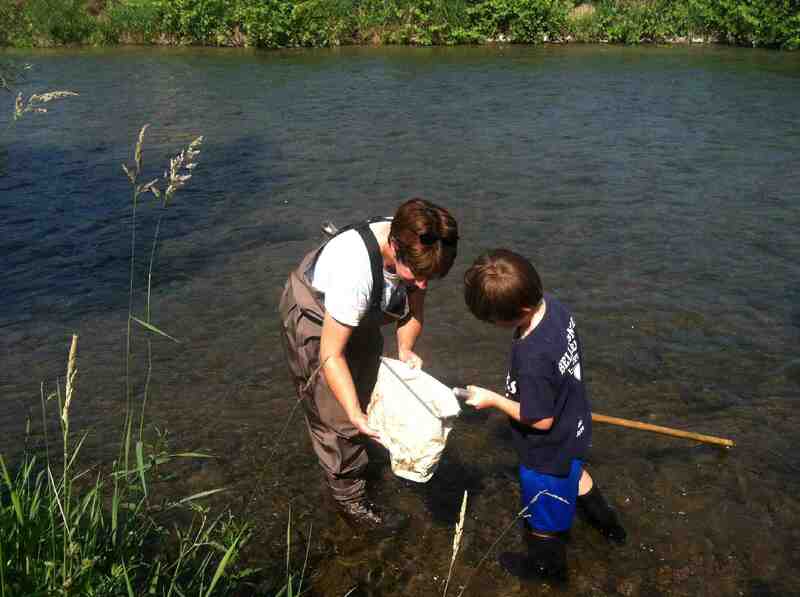 The three-mile stretch of Spring Creek between Bellefonte and Milesburg is a great summer fishing location. Even in the hottest weather the water temperature seldom exceeds sixty degrees in this stretch because of the influx of cold water from the big spring in down town Bellefonte. 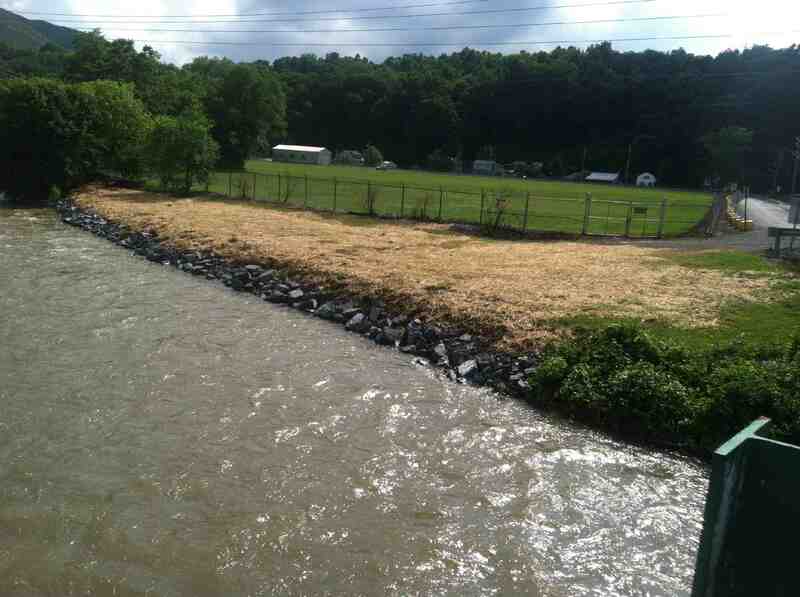 The PA Fish and Boat Commission also opened to wading the upper section of Fisherman’s Paradise, just two years ago. This is above the park area and upper parking lot where the grass in mowed. This section was always difficult to fish because of the trees, brush, and no wading law. Additionally the Pennsylvania State Correctional Institute at Rockview opened up the formerly closed to trespassing “canyon” stretch of Spring Creek between the Paradise and Benner Springs. Finally, a formerly closed-to-fishing section in downtown Bellefonte was also opened to fishing. The new water is between the High Street and Lamb Street bridges, if you don’t mind fishing “in town.” In all, these combined changes have added almost a mile of “new” fishing water to Spring Creek. And the entire section of open, accessible water on Spring Creek is all Catch-and-Release. 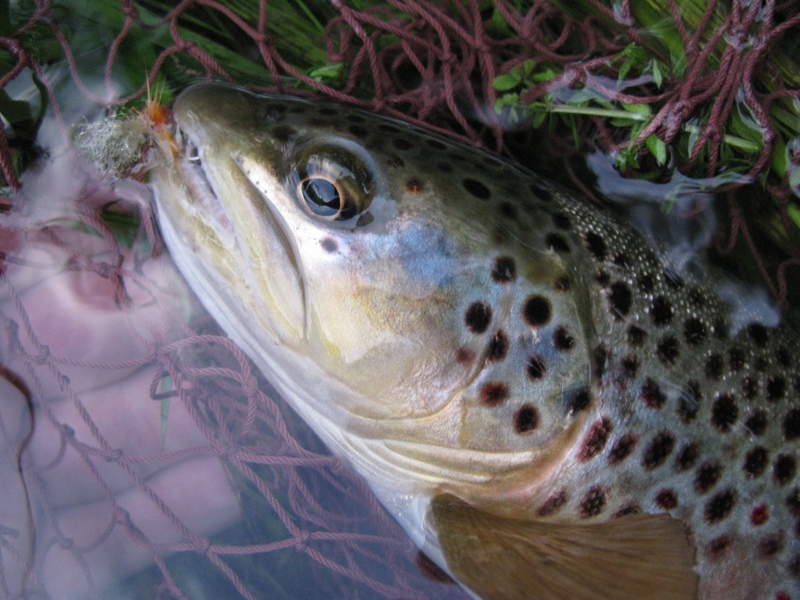 It is one of the best wild brown trout fisheries in the state of Pennsylvania. Give it a try!